UPDATED – TOKYO (CNS) — Heavy damage was reported to homes and farm land in the northern Philippines Oct. 20 after the strongest storm in three years struck overnight. Typhoon Haima barreled into northern Cagayan and Isabella provinces, ripping the roofs off homes and flattening crops. By late Oct. 21, 13 people had been reported dead, and Haima hit southern China. Nearly every building in the city of Tuguegarao was damaged, Philippine media quoted officials as saying. The city’s communication links were down Oct. 20, and phone calls to the archdiocesan office in Tuguegarao did not connect. Thousands of people in neighboring Isabella province spent the night sheltering in public evacuation centers such as schools and churches. “Most of the time, the churches serve as evacuation centers if the government evacuation centers cannot accommodate some of the people,” April Ann Abello-Bulanadi, a spokeswoman for Catholic aid group Caritas Philippines, said by phone from Manila. Caritas released a summary of reports from parishes of how they had prepared for the storm. Some of them reported holding stocks of relief goods. One diocese said it had been giving out disaster advice at Mass. And in one district, a church compound was designated the local relief staging ground for emergency supplies, so that residents and aid groups alike would know where to go. “The parishes are very important because they are the ones who are already present on the ground,” Bulanadi said. 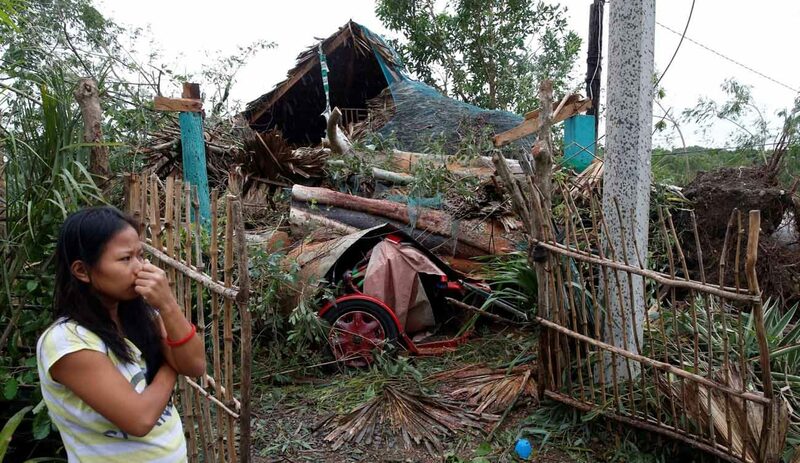 There was no estimate of the total damage to agriculture, but northern Luzon is a center of rice and corn farming, and the storm was feared to have wiped out crops shortly before harvest. The day after the typhoon, Caritas officials were expected to monitor video from a drone flown over the disaster zone by Philippine aerial imagery startup SkyEye Analytics Inc. Such images can identify communities that are cut off and roads that may be accessible for aid teams. Haima is the 12th typhoon to strike the Philippines this year. In November 2013, Typhoon Haiyan killed at least 6,300 people and forced around 5 million from their homes. The humanitarian disaster following Haiyan served as a wake-up call for authorities and residents alike. Today, aid workers say, there is a higher alertness by state agencies and greater willingness by residents to follow evacuation advisories. Caritas said Haiyan also highlighted the importance of community-led disaster risk reduction, such as identifying safe houses and checking on neighbors. In the three years since that disaster, Caritas has worked to create a more coordinated readiness by the church nationwide. “Now we are trying to include as many dioceses as possible, not just dioceses from the provinces affected, but we are also capacitating dioceses from the other provinces, so that they would also be prepared when such a typhoon like this would happen again here in the Philippines,” Bulanadi said. Catholic Relief Services, the U.S. bishops’ international relief and development agency, is part of the Caritas network. Matthew McGarry, country representative, said the “institutional knowledge” of responding and rebuilding structures and lives since Typhoon Haiyan have helped shape its approach today. In January 2015, Pope Francis paid a short visit to Tacloban, one of the cities badly hit by Typhoon Haiyan. At Mass in the city, he paid tribute to church and lay workers who helped those left homeless. “To those of you who housed and fed people seeking safety, in churches, convents, rectories, and who continue to assist those still struggling, I thank you,” he said. “You are a credit to the church. You are the pride of your nation. But there was a reminder of the Philippines’ storm-prone nature when Pope Francis cut short his visit. He said the pilots of his plane feared worsening conditions would prevent it taking off safely. Contributing to this story was Simone Orendain in Chicago.